Blackberries are surrounding me in my little kitchen, and I am doing my best to keep coming up with new ideas on how to use these wonderful berries. 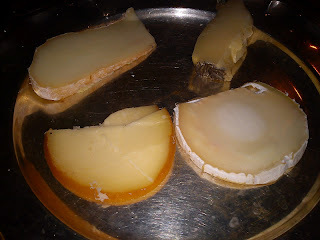 This time I decided to look into the future, where Christmas is getting closer and closer incl the different food types, which is consumed in connection with Christmas such as ris a la mande. This dessert is typical served together with cherry sauce, but why try to serve blackberries instead of. 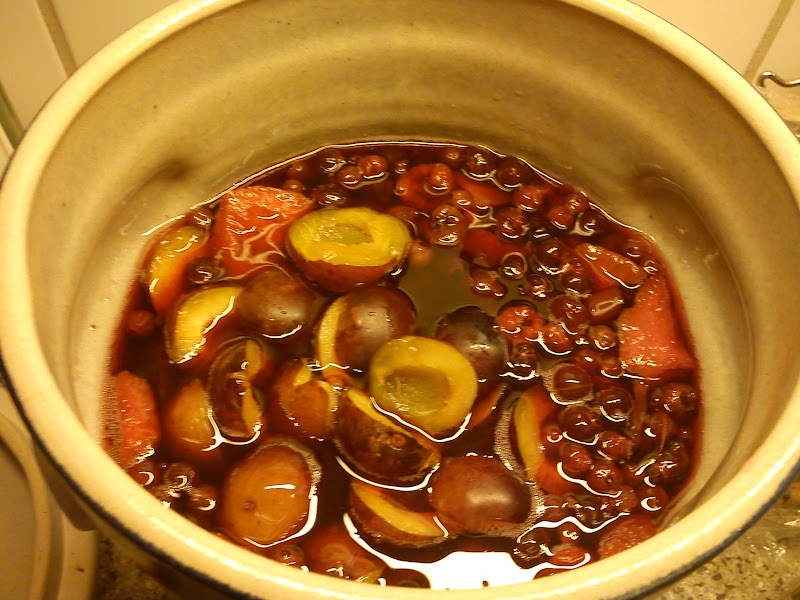 So I decided to use this recipe on plums in port a la Dansukker, an exchange the plums with blackberries and use white port instead of the usual red port. On a personal level I much prefer a glass on cold white port over a glass of red port. After the storage of the blackberries in the white port night over, the colour of the white port had turned into the colour of red port. Clean the plums, cut them in half and remove the stone. Place them in pot and fill the port on top. I use a small saucer in order to keep the plums down in the port, so they are floating around. Leave the blackberries for minimum 8 hours in the refrigerator. Add the dark Muscovado sugar and stir well. Add boiling water to the storage glass. Add everything into a cooking pot. Empty the glass for the hot water. Restaurant Remouladen has for the second year in a row been nominated to the title "Årets Frokostrestaurant" in the Danish Eating Out guide as the only restaurant from Funen and Jutland. 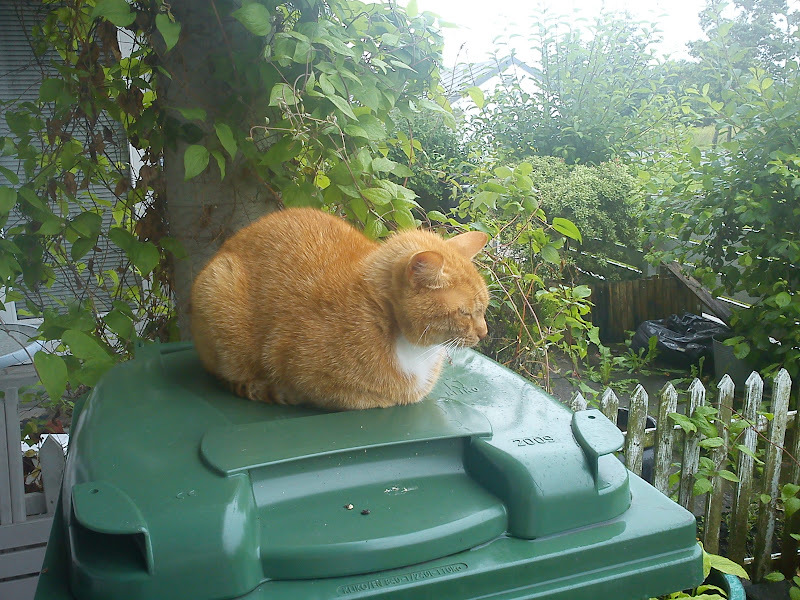 So when I got the option of eating where to half price, I grab the opportunity, and invited my good neighbour with me as a kind of thank you for looking after Hannibal the Cat, when I away from home. The first piece of open sandwiches was with fried filet of plaice with scrimps, watercress and remoulade. The fish was just perfect, and it was served warm just leaving the frying pan. 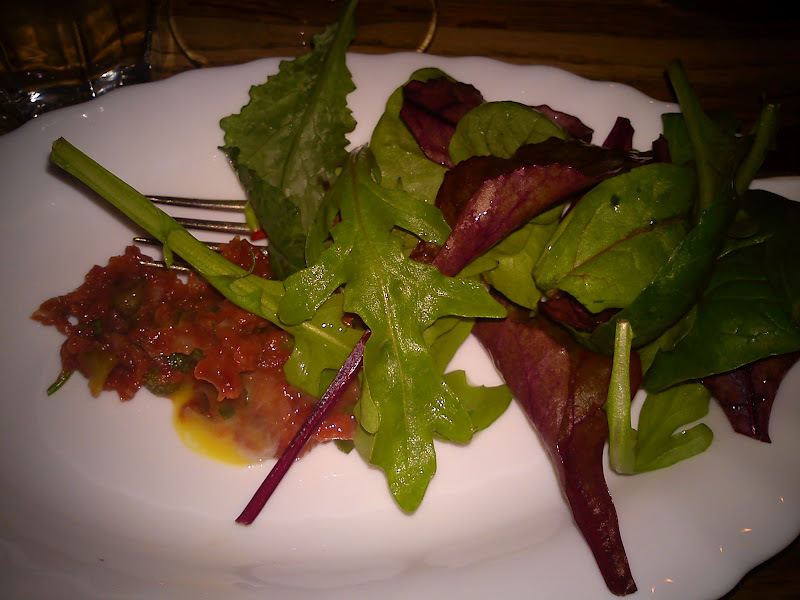 And the use of watercress instead of the usual lettuce leaf was an interesting finishing touch. The second piece of open sandwiches was tenderloin of pork served with mushrooms a la cream, butter toasted white bread and cucumber salad. Again here watercress was used giving green colour. The cucumber salad gave a good refreshing taste touch to this very creamy open sandwiches. 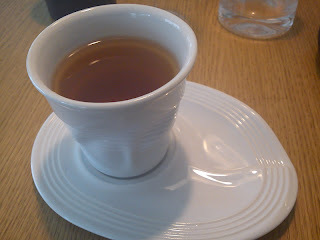 After two excellent open sandwiches we were served coffee and tea as part of the meal deal. I will be more than happy to visit Restaurant Remouladen again another time for lunch. Finally it is week-end after a week with three working days full of full-day meetings, so my head and I need to relax ! 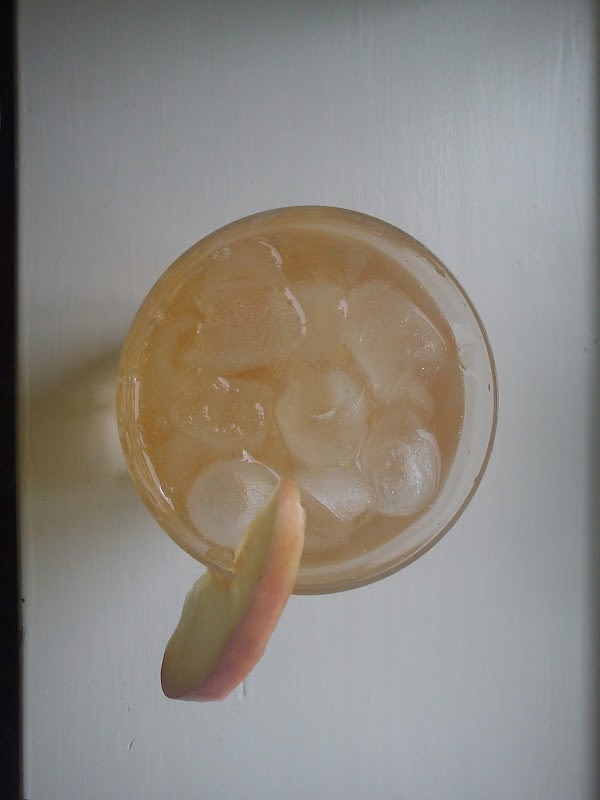 And what better way to do this, than by mixing a refreshing drink with plenty of taste and ice-cubes. I found the idea of mixing apple juice with elder flower cordial in the latest number of Idenyt, so I have been twisting this suggestion by adding in some vodka. Do yourselve the favour to use some good quality apple juice, so not the apple juice produced from concentrate, which many time is soo sweet tasting and lack the taste of apple. 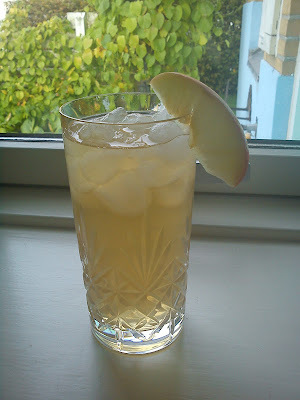 So I will relax, enjoy the beginning of the week-end in front of me, while I look into my garden, where I can see my family apple tree full of apples, sipping this wonderful taste combination of Apple Blossom. Pour apple into the glass as well. I keep getting blackberries from my good working colleague, so I have to keep thinking of new ways to use these wonderful tasting berries. I could decided to stick using these blackberries in the usual tested recipes, but when I would have nothing new to share with you. So I keep putting on my "positive thinking hat" on how to use these beautiful Autumn berries. This time I have taken inspiration from blackcurrant rum, so simply replacing the blackcurrants with blackberries, while maintaining the same ratio of fruit, sugar and rum. So I assume, that I sometime during Autumn/Winter should invite my very good friends from Horsens to a new expert tasting of these fruit alcohols, so we again can select the best tasting fruit alcohol as we also find last year, where we spend an evening selecting the best fruit alcohol of 2011. 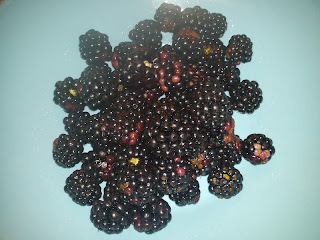 Stay turned for more new posting to how to use blackberries, as I keep receiving blackberries. Round lemon cake from "Te og kager - året rundt"
The Tea Time Treat event is a little different for the month of September, as it is a hybrid of the usual Tea Time Treat combined with another blog event called Random Recipe. 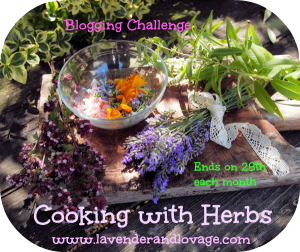 Behind this challenge you will find Karen from Lavender and Lovage, Kate from What Kate Baked and Dom from Belleaukitchen. 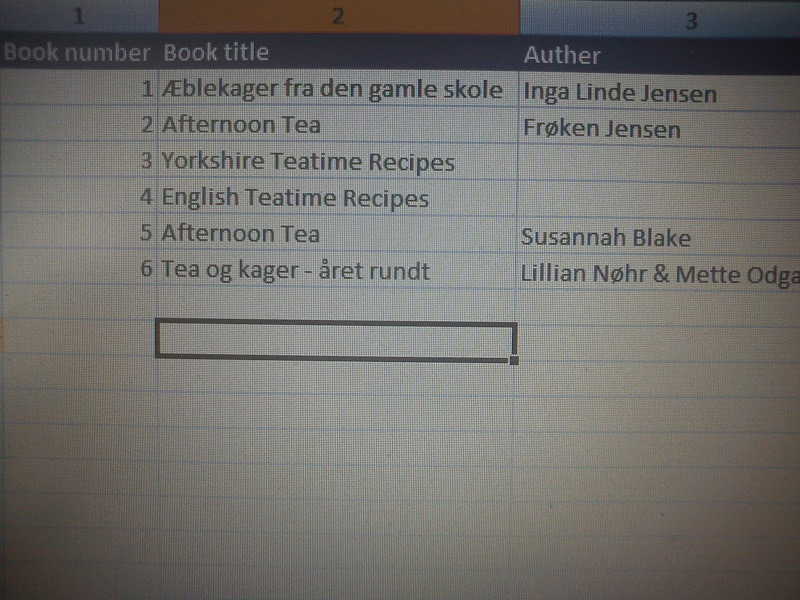 So I started this challenge by locating all the cooking books, which could be used in connection with making afternoon tea, I found a total of 6 books. However, as they are very different in size, I decided to type the title on a list, so my fingers would not find their preference being biased by my brain. 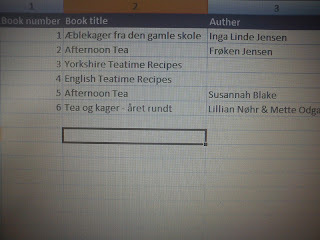 Afterwards I "asked" Random.org to select a number, and it turned out to be the cooking book called "Te og kager - året rundt" af Kaffe & Thehuset. This is very good choice, as I have never tried any of the recipes in this book. 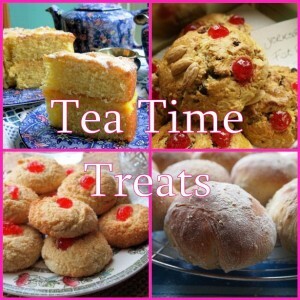 It took a few look ups to find a recipes, as this cooking book is having suggestions on tea targeted the different season. The first recipe I found was on making strawberry jam, which is a bite out of season being in September. 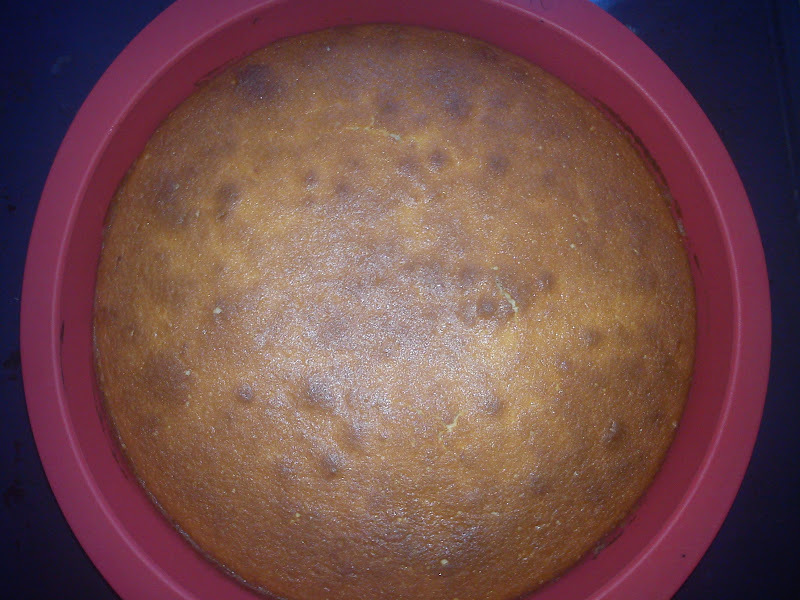 The second recipe found by my fingers was then Rund Citronkage (Round Lemon Cake). 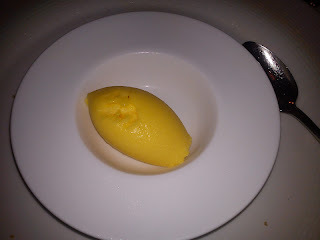 The cake dough has a soft, silky and smooth consistency and the taste is a very perfect combination of lemon taste, acidity and sweetness, which some how reminds me about lemon mousse. And the final touch in form a lemon juice sugar icing is adding the final touch to the easy-to-make cake. 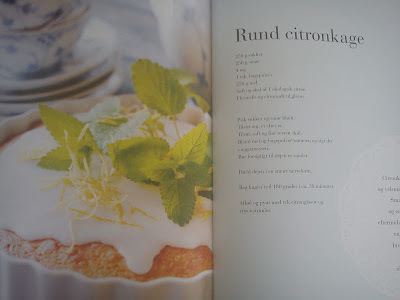 This cake could be considered as a home-made version of the widely known Danish cake "citronmåne" (lemon mone). However, the taste is a million times better !!!! Whip sugar and butter together. 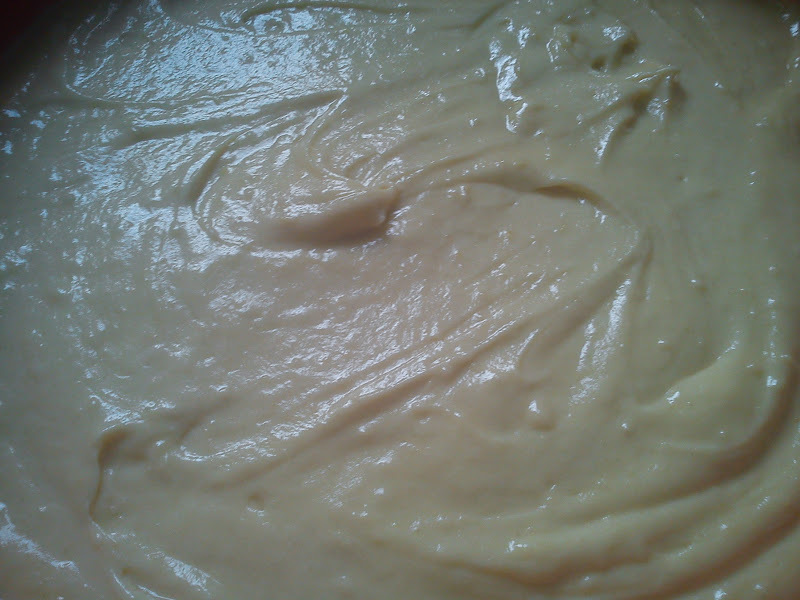 Add the eggs one by one and whip each egg into the cake dough. Add lemon peel and lemon juice, whip into a homogeneous mass. Add the baking powder and (cake) flour, whip yet again into homogeneous mass. Bake the cake at 200'C for 30 minutes. Left the cake cool down. 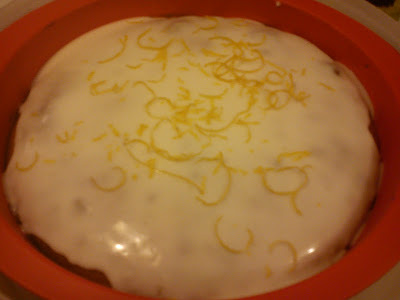 Make cake icing from icing sugar and lemon juice. After adding the icing on top of the cake, decorate the icing with lemon peel. 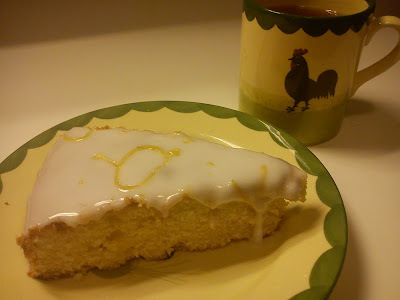 Make a pot of Earl Grey tea and served it together with the lemon cake. 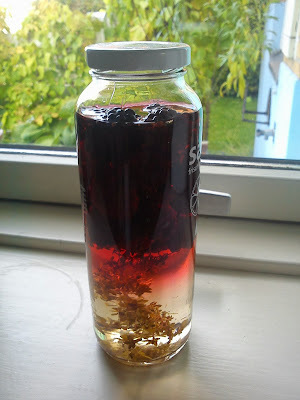 I have received two portion of blackberries from my good work colleague last week, so I decided to make another twist to blackberry vinegar with rosemary, which I created last year. 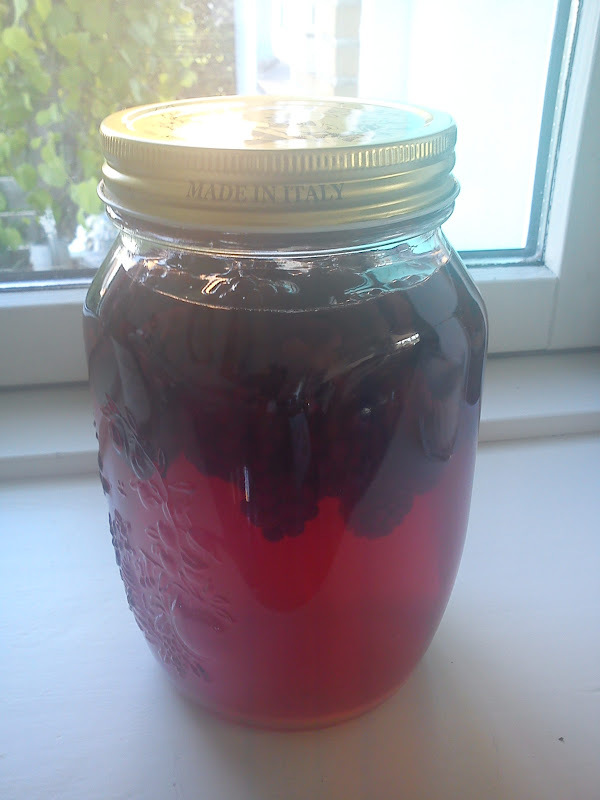 Wash and dried the blackberries. Empty the glass for the water. Add the blackberries into the glass. Fill the glass up with plain white wine vinegar. 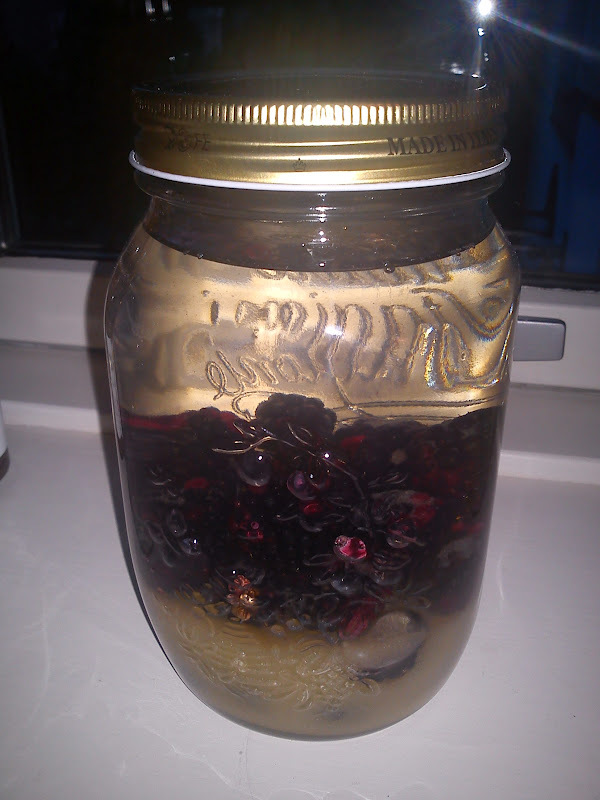 Remove the blackberries after 1 month. 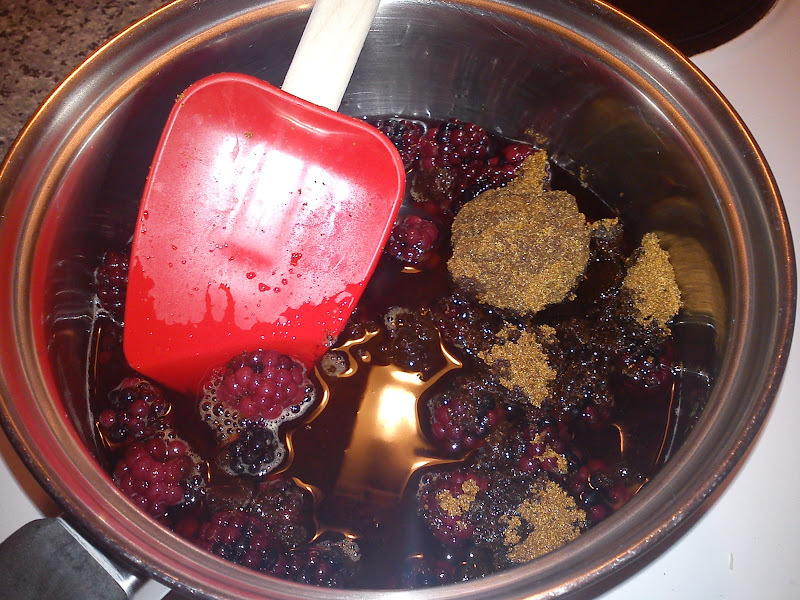 Store the blackberry vinegar in a dark place. 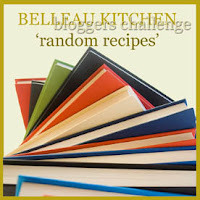 Some time ago I participated in a give-away hosted by the inspiring Danish food-blogger Klidmoster, who celebrate 1000 fans on her facebook page. The winner could win a dinner together with Klidmoster. 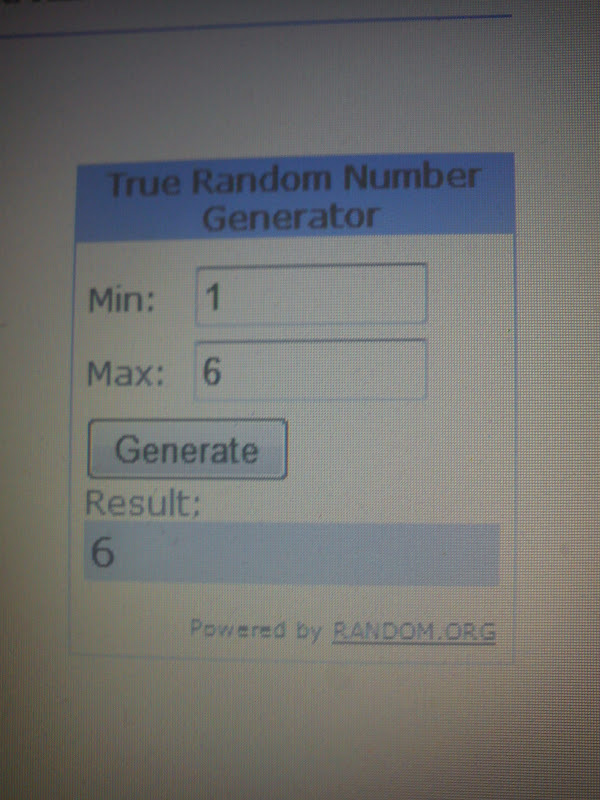 When very recently Klidmoster on behave of the restaurant owner of Klassisk 65 invited all the participants in the give-away competition to meet up for mussels and cava at Klassisk 65. 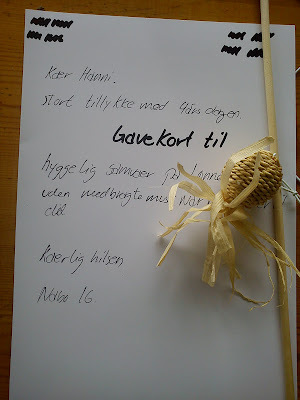 Yes, I had participated in the original give-away and I went back to read my original comment to Klidmoster: "Hej Malou ! Congratulation with this mile stone of yours. It could great to meet you in real life besides from your presence here in virtual life. Many kitchen greeting Kirsten". Wednesday evenings I am normally busy with "water ballet lesson", but this is weekly occasion, whereas being able to meet Klidmoster in "real life" would be an rare occasion, so I decided to say "yes, please" to the kind invitation. 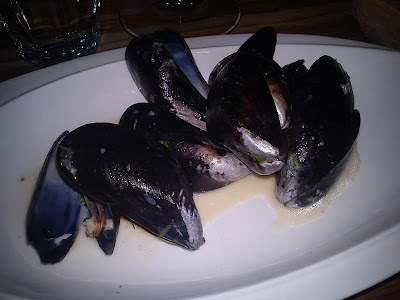 Even it meant eating mussels, which is not on my top 5 of seafood dishes, however, cava is just the treat for a champagne girl like me. Signing up for this event felt quiet out of my comfort zone, as I knew no one at all for this upcoming event. However, I felt obliged to sign up looking at my comment to Klidmoster. Approaching the restaurant Wednesday evening I saw a huge group of people standing outside, waiting for the door to open and let all the fans of Klidmoster in-side to be wined and dined. Blogging, this specific invitation, our reason for blogging and the fantastic meal almost sparked the talk around the table as well as all the camera phone, as we kept taking pictures of the food. It is going to be interesting, which of us four bloggers, who will be posting the first post on this event ? It was actually the very time for me eating tatar, now I have tried it, but I will not freely order tatar on my own another time. 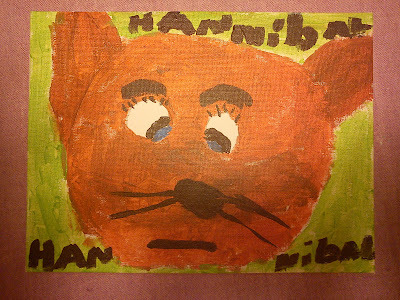 The thought about raw meat and unknown bacteria is main reason for not doing this, so you may call me sensitive. Going home from the event, I felt great and such energy having moved myself out off my own comfort zone and meeting up for this event with all these unknown people. One thing is to sign up for conference at work, where you also know no one, but here you come together with your job/profession as "backing group". 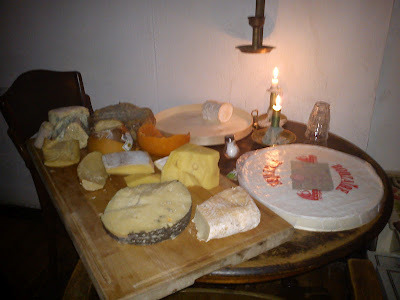 I am feeling much more comfortable for turning up at another event, where you can meet food-bloggers in "real life". Blackberry singing in the sun of Autumn, take these blackberrier and learn to cook. Blackberry is a wonderful autumn fruit, which you actually can collect yourselves for free in the Danish forests. The blackberry season started 2 weeks ago here in Denmark, and I can see from my blog postings done in 2011, that the blackberry season continue until mid November last year. So you have plenty of time to go and pick your own blackberries and test them in one or more of the recipes with focus on blackberry below in this blog post. I am in this luckily situation, that a good work colleague of mine supply me with freshly picked blackberries from his garden very frequently during autumn time, so I do not even have to go a pick my own blackberries, this is first class service. Blackberries swimming around in the "rum soup"
I receive some more fresh blackberries from my good work colleague again this week. And it has been and still is busy work week for me, I decided to turn of these blackberries into "raw" blackberry jam (recipe to follow later) and put the rest of the blackberries up on top the blackberries already swimming in the Rumtopf, so less time consuming kitchen activities. In my weekly vegetable box from Årstiderne I recently receive a small of portion of redcurrants with a few white redcurrants. 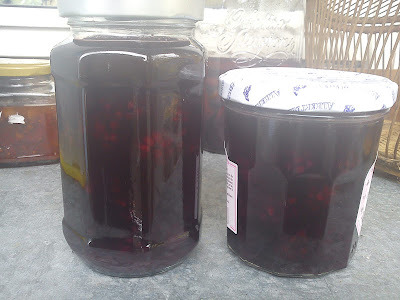 As I was not eager to eat redcurrants as I find them to been rather acidic, and I already have added redcurrants in the Rumtopf, so therefore I turned these redcurrants into jam. Due to the higher acidity level in redcurrants, I decided to use a ratio of 1 part fruit to 1 part of sugar. 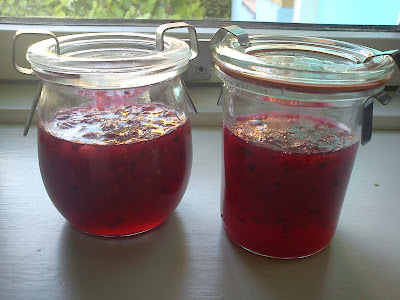 I could also very easily imaging to serve this redcurrant jam as a condiment together with meat dishes. Well let´s see, how I actually end up using this redcurrants jam. Mix the redcurrants with water in a cooking pot. I use a small amount of water, as the fruit is fresh and therefore not giving off water themselves so easily. If you are using frozen water, there is not need for addition of water.Cook up to the boiling point. When the redcurrants are boiling, add the jam sugar. 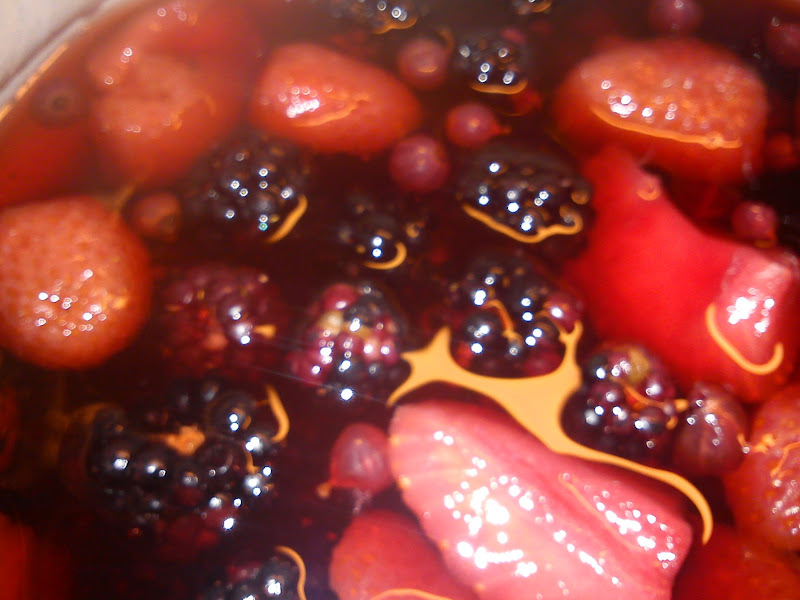 Bring the fruit and sugar to the boiling point and let it boil for 5 minutes. Fill the glass with jam and close the glass. Store them cold. Celebrating the fourth year birthday of Hannibal the Cat was just an excuse for gathering some good local girls friends on an ordinary week day having a drink or two. 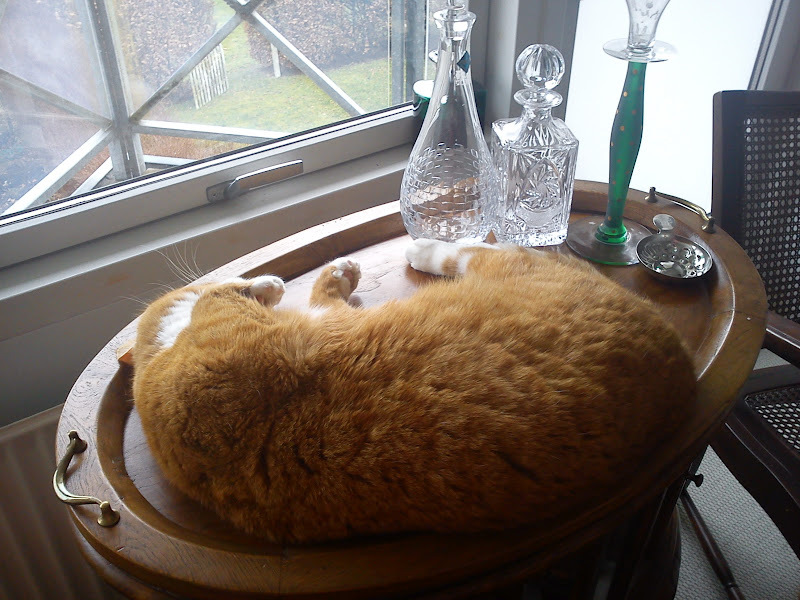 Even Hannibal the Cat decided to join us in "celebrating" him and his 4 years, as he stay in-side the house looking at us from "his" chair in the window bay. And some of guests were bringing some birthday gifts along - so Hannibal the Cat now has a new toy and a gift card for a "stay away from home" at his good neighbour. 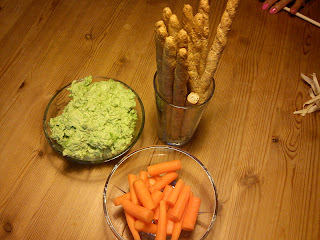 As company for the cocktail of gin with lime and rhubarb cordial I served carrots and grissini together a "humus" of edam beans and peas. 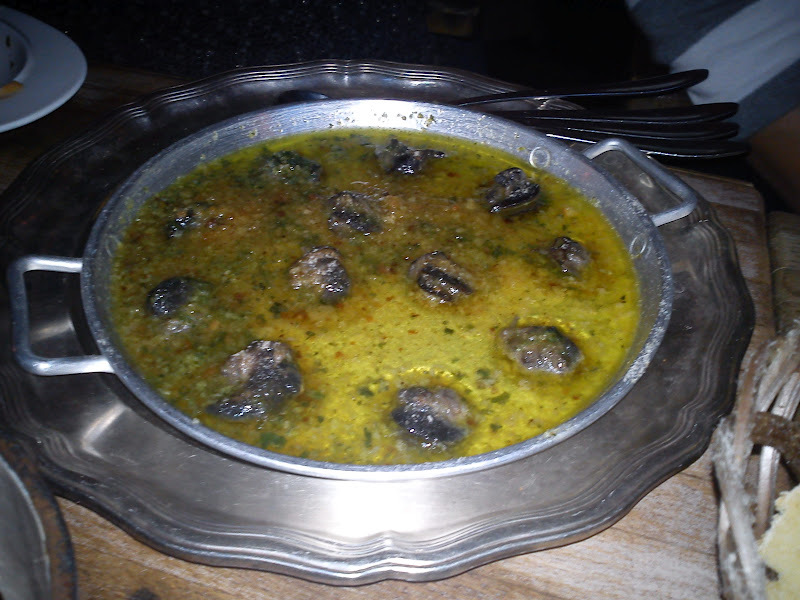 This "humus" was tasting so great, I will share this recipe with you in the coming few days. Again it has taken some time, since the a new fruit has been ready to move into the "rumtopf", so 3 weeks after the plums were jumping into the "rum soup", the first blackberries from my work colleague´s garden have ripened, so now they are swimming around together with all the other summer fruit in the "rum soup". The "only" fruit lacking in the "rum soup" is cherry. As mentioned previously I spend some part of my second summer vacation rowing around the Island of Funen. On our third rowing day we had the most tricky part of the entire tour, which is to pass Fyns Hoved (the north east top of Funen), where you are rowing in some very open water being in Kattegat and turning into Storebælt (The Great Belt), so the water and wind need to be on your side and not against you !!! In the evening of the second rowing day the success rate for passing Fyns Hoved looked close to 0%, so we were considering making changes to our plan. Getting up in the morning on the third rowing day the sea and wind looked much more promising, so we checked, double checked and tripled checked the weather forecast by calling a living meteorologist, who gave us a window of opportunity of 5 hours with less wind at Fyns Hoved. We grab this opportunity with both rowing hands, full luggage aboard and our rowing boats and headed towards Fyns Hoved. We got around Fyns Hoved in grand style and from here put the course towards Kerteminde, a total rowing tour of 52 km, where we had a strong wind against us for the last 7 km into the city of Kerteminde. Rowing with both wind and current against in through the channel from the harbour into the rowing of Kerteminde, we passed a very nice looking restaurant next to the channel. 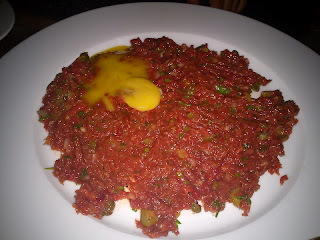 We talked about eating there, but were unsure about the price level, as it looked expensive. After arriving at the rowing club we called various restaurants without any luck of getting a table, as we would first be able to be there at 9 PM. Finally a restaurant informed us, yes there is a table for you, also at 9 PM. It turned out to be the nice looking restaurant at the water known as Rudolf Mathis. We arrived freshly washed with wet hair, jeans and T-shirt and was seated at a table more or less in the middle of the restaurant. We were not hided away any where. As we had managed one tricky part of the rowing tour we decided to start with welcome drink in form of sparkling wine, which suited perfect to our happy and sparkling humour. We also shared a bottle of white wine for 6 person, but otherwise the waiter can having time filling up our water glasses after a long day on the water. One of my rowing friends are suffering from lactose intolerance, again here this restaurant had no problem at look in making her dishes with any use of milk, cream and butter. 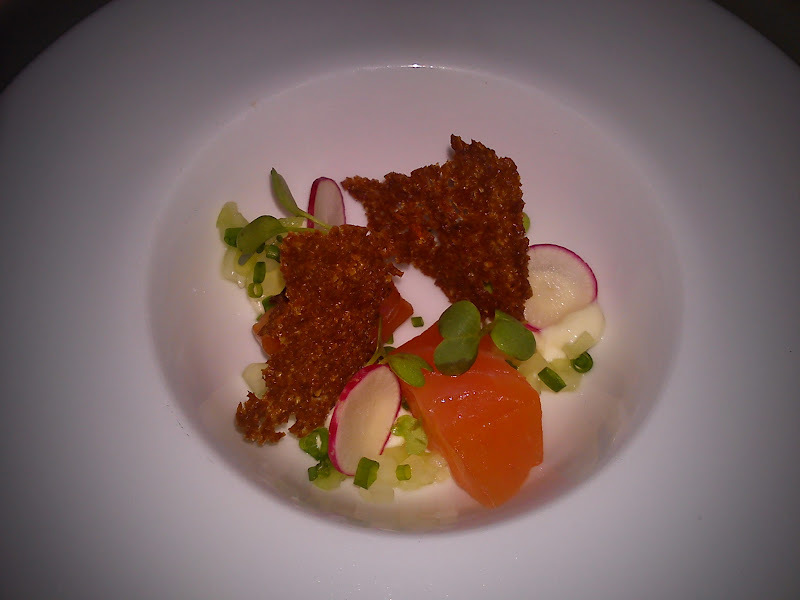 And her dishes looked just as appetising as our dishes. We arrived at 9 PM, the second last table left the restaurant at 10-10.30 PM and we left as the very last table around 11.30 PM, and there was no hurry at all in getting us of the restaurant, so they could close down. 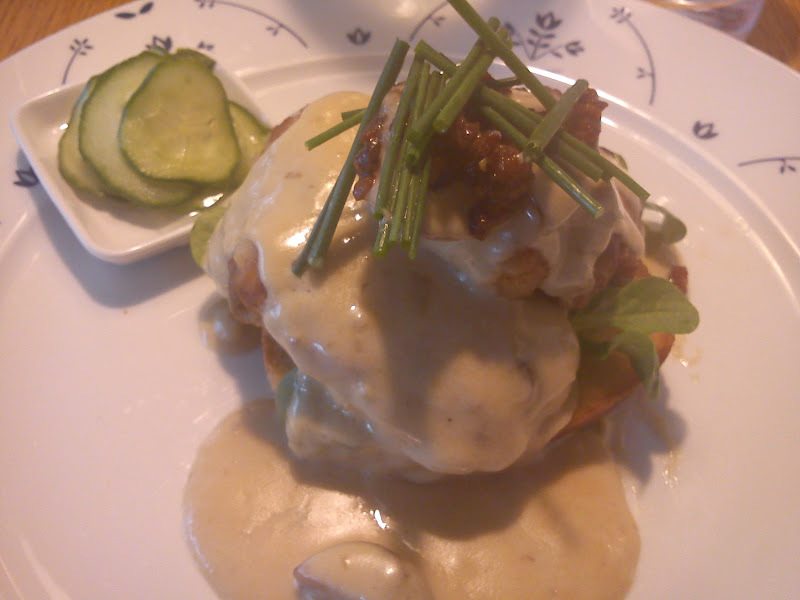 For my part of this meal I paid 875 DKK incl. wine, which is the right price level for such fantastic food and good service. And it was putting an excellent dot to a fantastic rowing day. 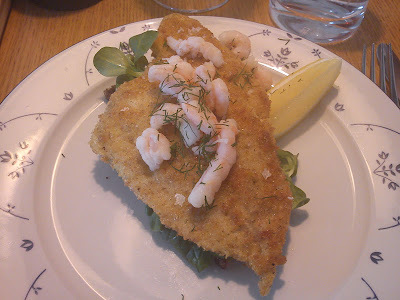 So I can only recommend you to try Rudolf Matis in Kerteminde. 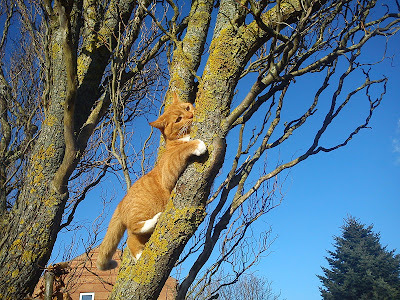 Below you can see, that I was eating. 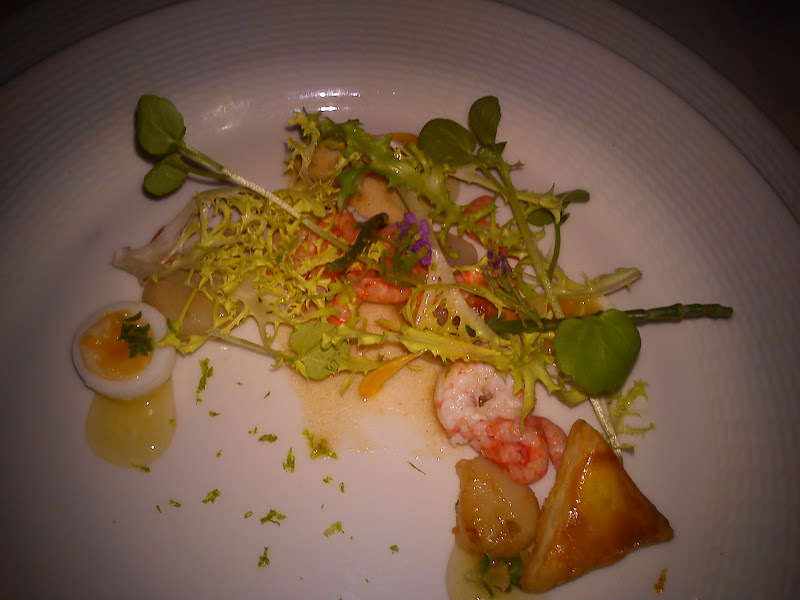 Norway lobster with roasted scallop with herbs from the beach/coast side, crispy salad, lemon fillet and seafood vinaigrette. 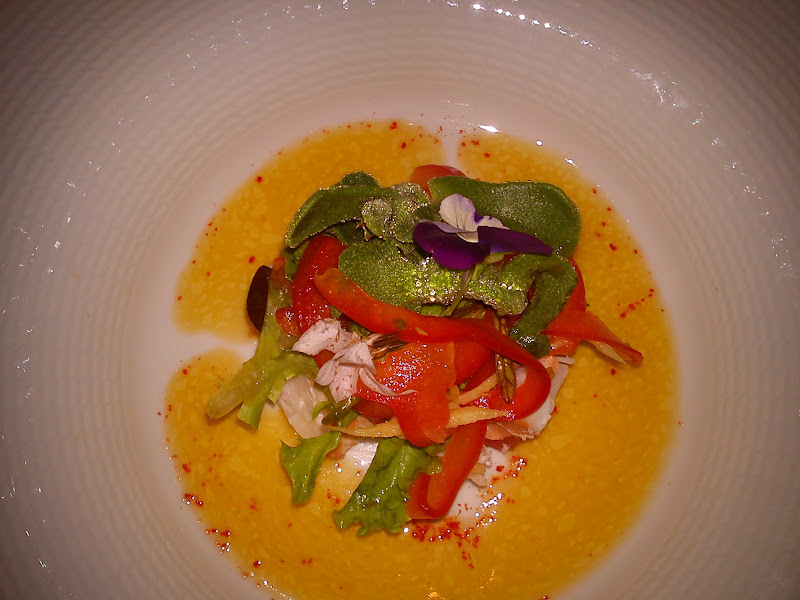 Danish lobster with lemon grass, ginger, pimento and grapefruit marinade. 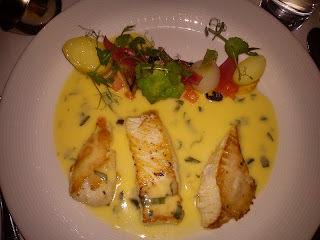 The main being three different fish prepared over open grill: lemon sole, halibut and monkfish. 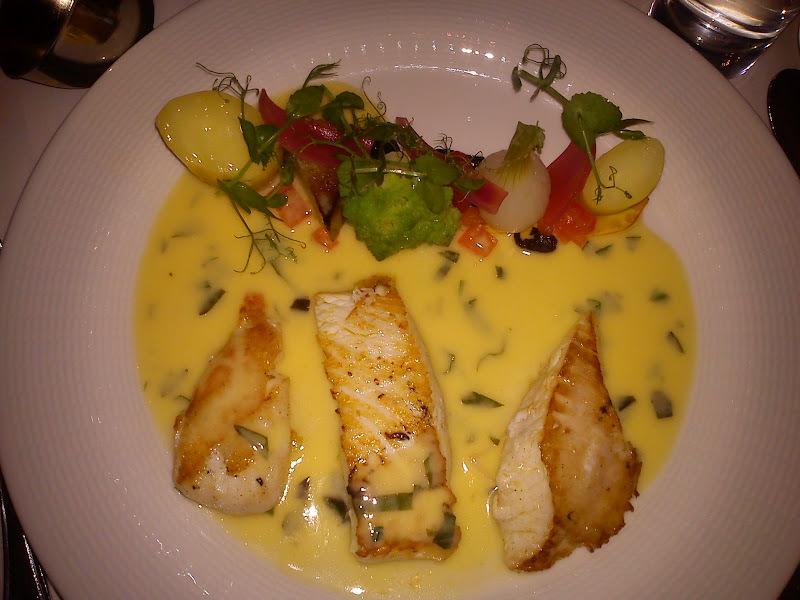 The fishes were served together with basil beurre blanc and vegetable in form of nicoise olive, tomato, courgette, romanesco cabbage, potaoes, which were decorate like an eatable flower decoration for your hair, a nice elegant touche. 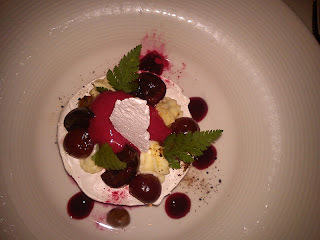 The fourth and final dish was dessert in form of a great combination of cherry and liquorice with vacherin of cream and condensed milk and meringue. The green leafs looking like fern is sweet cicely, which taste of liquorice. A perfect end to a perfect meal and perfect rowing day, where we managed to pass the tricky part of Fyns Hoved on our rowing Odyssey. Guess who is having birthday today ? 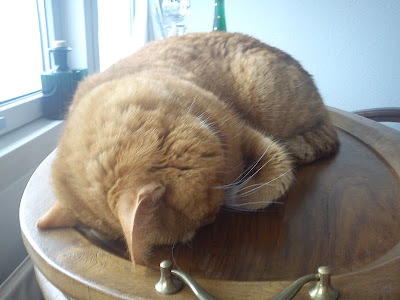 Well, it is not me, but Hannibal the Cat turns four year today ( I assume you already guessed it from the headline to this blog post). Hannibal the Cat is the garden lion of my little blog - he is not active at all in my kitchen, unless he is destroying the butter pot on his way of getting hold of his favourite butter - Thise organic butter. 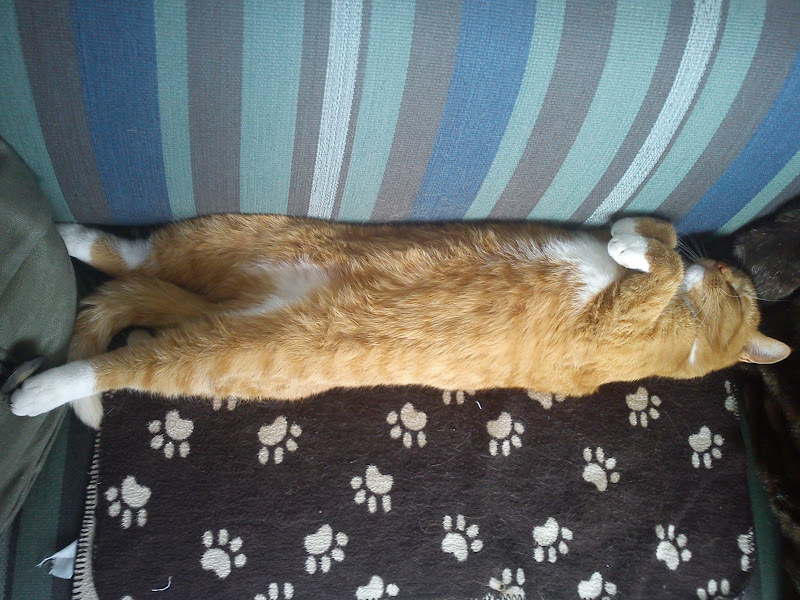 However, he is quiet capable for making his very own mouse sushi, which he luckily enough never brings home (highly appreciated by me). 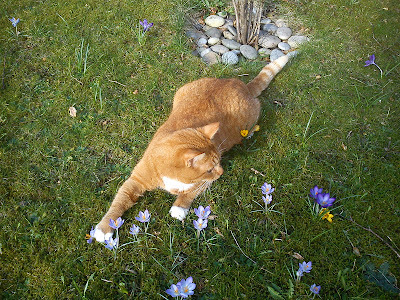 Hannibal the Cat spend most of his awaking time away from home, enjoying the nature surrounding my house and garden in form of fields and forest. 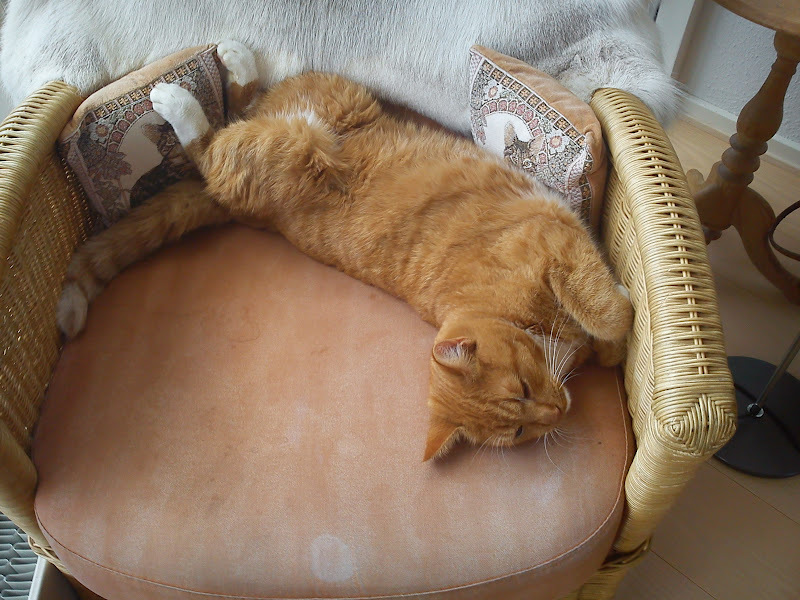 So when he is at home, he spend most of his time sound at sleep in many funny sleeping positions, which you can see some off below. 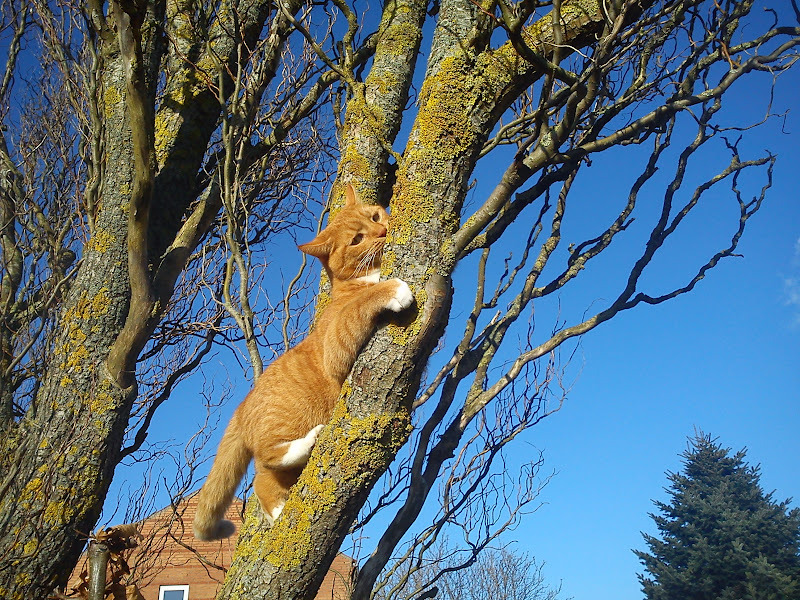 Hannibal the Cat is also a keen climber, he really enjoys moving up and down in the one and only troll willow of my garden, and when he is doing this, I call him a "monkey cat". I will not call Hannibal a keener gardener, but he really likes to follow my various on-going activity in the garden, some time snicking in on me like a silent hunter. Hip - hip - hurra to Hannibal and I wish you all the best in the coming year. PS: your birthday guests will first come around Thursday next week - well you are probably not a home any, when the guests arrive !!!!! When ever I have travelling in Italy, I always bring limoncello home with me, as I have an addiction to this sweet lemon flavoured liqueur. So when I found this recipe on limoncello by Louisa Lorang, I decided to try to make this addiction of mine on my own. As you are using the peel of lemon, I would strongly recommend you to use organic lemon, as these lemons are not treated with un-wanted things. So therefore I made an extra order together with my weekly vegetable box from Årstiderne. And I got 10 lemons, so therefore I have started a "new production" of limoncello. I am really looking to enjoy this lemon flavoured vodka ice cold dreaming about excellent Italian food and Italy. Peel the lemons with potato peeler, avoid to have to much of the white part of the peel. Empty the storage glass for boiling water. 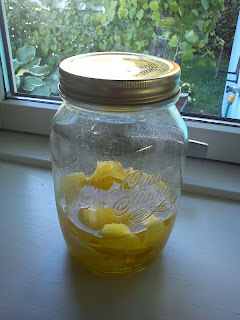 Place the lemon peels in the storage glass. Pour vodka on top of the lemon peels. 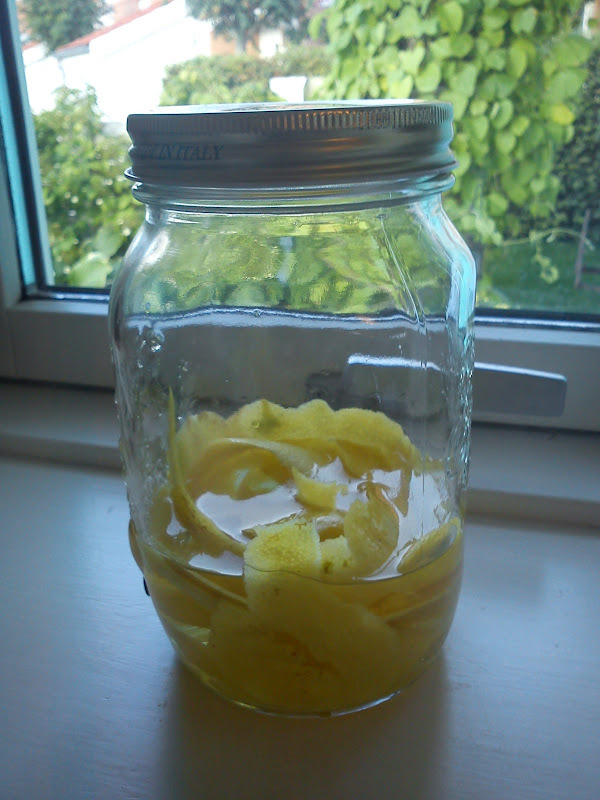 Let the vodka and lemon peel rest for 6-8 days. Make a sugar syrup from boiling water and sugar together. Cool the sugar syrup down, before adding it to the lemon vodka. Remove the lemon peel 1 day after addition of the sugar syrup. 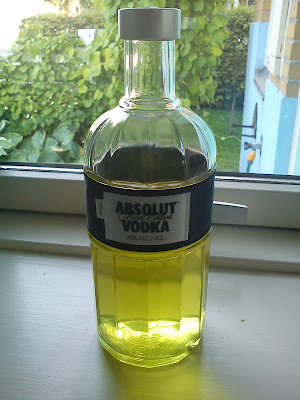 Fill the lemon flavoured vodka into a bottle, which has been scalded. 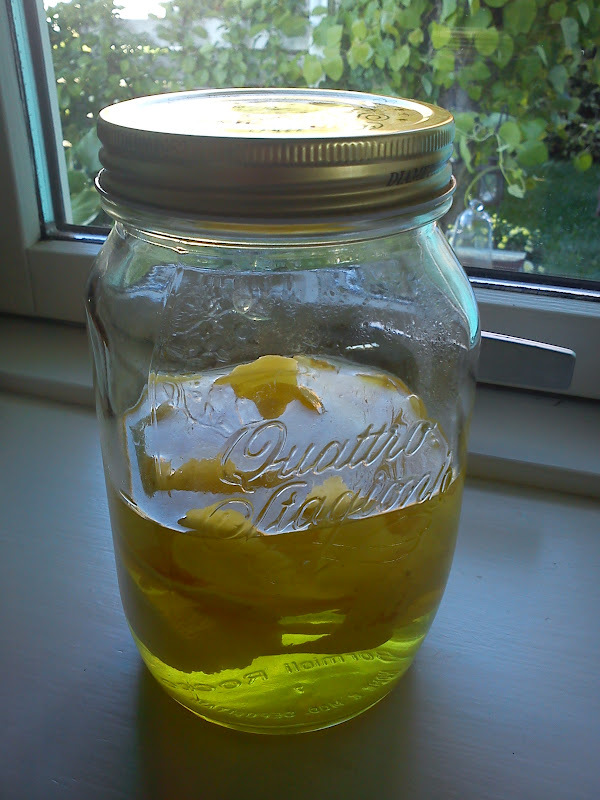 Store the lemon flavoured vodka in the refrigerator. Serve the lemon flavoured vodka ice cold with ice cubes. Raw plum jam - failure ?